Among the founders of the world’s major religions, the Buddha was the only teacher who did not claim to be other than an ordinary human being. Other teachers were either God or directly inspired by God. The Buddha was simply a human being and he claimed no inspiration from any God or external power. He attributed all his realization, attainments and achievements to human endeavor and human intelligence. A man and only a man can become a Buddha. Every man has within himself the potential of becoming a Buddha if he so wills it and works at it. Nevertheless, the Buddha was such a perfect human that he came to be regarded in popular religion as super-human. Man’s position, according to Buddhism, is supreme. Man is his own master and there is no higher being or power that sits in judgment over his destiny. If the Buddha is to be called a “savior” at all, it is only in the sense that he discovered and showed the path to liberation, to Nirvana, the path we are invited to follow ourselves. It is with this principle of individual responsibility that the Buddha offers freedom to his disciples. This freedom of thought is unique in the history of religion and is necessary because, according to the Buddha, man’s emancipation depends on his own realization of Truth, and not on the benevolent grace of a God or any external power as a reward for his obedient behavior. The main events of the Buddha’s life are well known. He was born Siddhartha Gautama of the Shaka clan. He is said to have had a miraculous birth, precocious childhood, and a princely upbringing. He married and had a son. He encountered an old man, a sick man, a corpse, and a religious ascetic. He became aware of suffering and became convinced that his mission was to seek liberation for himself and others. He renounced his princely life, spent six years studying doctrines and undergoing yogic austerities. He then gave up ascetic practices for normal life. He spent seven weeks in the shade of a Bodhi tree until, finally, one night toward dawn, enlightenment came. Then he preached sermons and embarked on missionary travels for 45 years. He affected the lives of thousands—high and low. At the age of 80 he experienced his parinirvana—extinction itself. This is the most basic outline of his life and mission. The literature inspired by the Buddha’s story is as various as those who have told it in the last 2500 years. 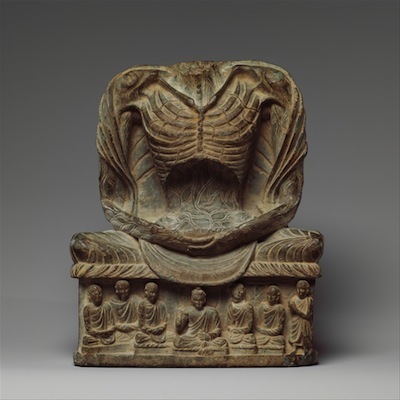 To the first of his followers, and the tradition associated with Theravada Buddhism and figures like the great Emperor Ashoka, the Buddha was a man, not a God. He was a teacher, not a savior. To this day the Theravada tradition prevails in parts of India, Sri Lanka, Myanmar, Cambodia, and Thailand. To those who, a few hundred years later, formed the Mahayana School, Buddha was a savior and often a God—a God concerned with man’s sorrows above all else. The Mahayana form of Buddhism is in Tibet, Mongolia, Vietnam, Korea, China, and Japan. The historical Buddha (Siddhartha Gautama) is also known as Shakyamuni. Cite this page as: Dr. Jennifer N. McIntire, "The historical Buddha," in Smarthistory, August 9, 2015, accessed April 19, 2019, https://smarthistory.org/the-historical-buddha/.